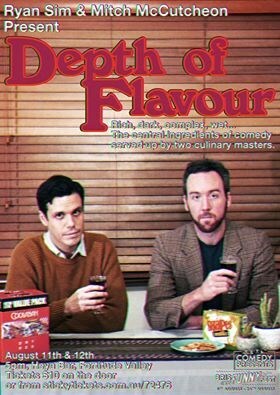 Rich, dark, complex, wet... the central ingredients of comedy. Ryan Sim and Mitch McCutcheon are culinary masters when it comes to serving up delicious jokes for audiences to chew on. They've prepared a tasting menu that is both distinguished and daring, a veritable smorgasbord of juicy punchlines on which to gorge yourself... and more than one or two surprises! Textured, flavourful, bold... this is Depth Of Flavour. (Ryan and Mitch are also very strong and handsome).